Here we have a platoon level sniper of the Red Army equipped for the early to mid part of the great patriotic war. There were two such snipers forming part of each infantry platoon of the Red army given it a far higher proportion of snipers than any other army. They could either be integrated into the unit or work separately, often with other snipers, as the situation dictated. He is on the march so heavily loaded for a sniper, the majority of his equipment would be dropped before heading into battle. He is also unusually well equipped for a soldier of this period, given the massive losses in equipment suffered during the defeats of 1941. However this serves to well demonstrate the type of equipment that was issued to soldiers during the war. ¹ The full colour M35 insignia was replaced by a subdued M41 version in 1941. Cap stars were ordered to be painted green. However M35 insignia could still be seen throughout 1941. ² This should be worn with a white liner swen into the collar. ³ A cheaper alternative is to use the fake leather two tone post war models and paint them to look like real leather. As Y-staps were rare after 1941 it does not matter that they lack the loops on the rear. * Be sure to avoid the 2 pocket F1 pouches as these are postwar. ** E-tools were always in short supply so many thousands of captured German ones were pressed into RKKA service. German fighting knives and bayonets could also often be used. *** This is a very early war item and largely disappeared after 1941 so surplus to requirements for a later impression. All prices are approximate. 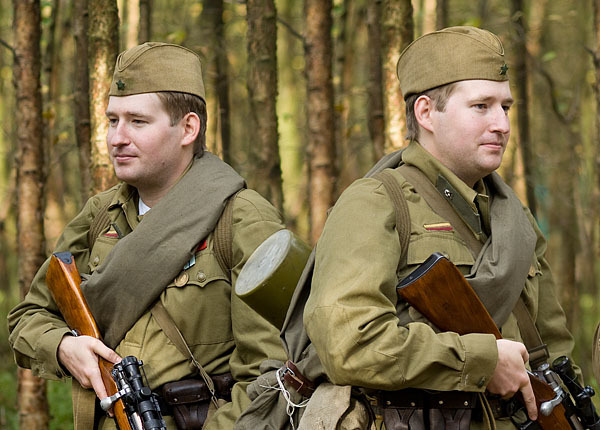 Also try Militaria Fairs – they can contain some real bargains. Most items can be bought on Ebay easily.